Westway Plaza has been sold. Photo credit: Jud Haggard. HOUSTON – (Realty News Report) – The Aztec Fund, Inc., a private Mexican equity fund, acquired Westway Plaza, a recenly constructed office building totaling 313,420 SF. 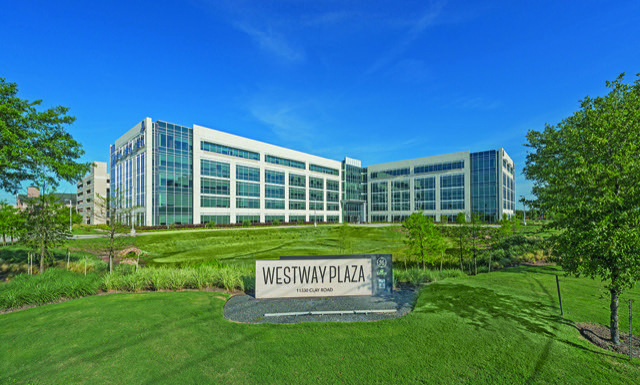 The HFF team marketed the West Houston property on behalf of Transwestern Development Co.
Westway Plaza is situated on 9.85 acres at 11330 Clay Road at its intersection with the Sam Houston Tollway in Houston’s West Belt Corridor. Completed in 2015, the LEED Gold building is fully leased to three tenants: General Electric Corporation, Superior Energy Services and TESCO Corporation. The HFF investment advisory team representing the seller included senior managing director Jeff Hollinden and analyst Dane Petersen.